many i know are going through huge tranformation & transition in their faith. it’s a scary, scary process. giving up clearly held tenets of the faith: hills we used to be willing to die on….issues we used to be bulldogs about, refusing to waiver…positions & theology that brought us a wonderful sense of comfort because they were just so “clear”…”it says right here in the Bible” kinds of answers to extremely complicated questions. i recently shared with a friend that all of this spiritual shifting can feel a lot like the game of jenga. in the game of jenga, the idea is to keep the tower from falling when various pieces keep getting taken out. in the game of spiritual jenga, some of us wonder, “if i take out this piece is the whole christian tower going to fall any minute?”….”will this one end it all for me?”…”how far can i go before the whole thing crumbles?” lots of times i think “i’m a pastor for goodness sake, i can get in trouble for this!” (by who, i have no idea, it’s just the weird stuff that rattles around in my head and i am so grateful for my community where we can process a lot of these jenga pieces out loud, look at them, talk about them, disagree about them and still love each other and trust each other’s journey). regardless of the holes, i still believe in Jesus. i still believe in the weird and crazy ways of the Spirit, the unexplainable way God brings hope and peace and freedom to darkness and brokenness and emptiness. the upside-down ways expressed in the sermon on the mount still resonate in deep places in my heart and stir up a desire to live this short life on earth differently. i believe in the power of Jesus’ love and that it gets expressed in many diverse and wonderful ways that cross over our limitations of language and expression and culture. i do still really love the power and conviction and hope scripture sometimes brings. and when i think of the power of the cross this holy week, it is comforting to me in ways that all of my cynicism about weird religious stuff and church politics can’t take away. i don’t have new answers to all of the jenga pieces i have taken out over these past few years. it’s not like i just replaced the blocks with new certain, stronger, better ones. i am living in the tension of a lot of holes, a lot of uncertainty about things that somehow don’t seem to matter as much as i thought they did. some blocks i’ve looked at for a while and put back in. they didn’t need to come out all the way. others, i honestly don’t think they are going to be finessed back into place or placed back at the top; they’re pretty much out of the game. when i reflect on Jesus’ ministry in the gospels i am reminded that he didn’t really have a long list of pieces that i needed to have in my jenga tower in order for it to stand. in fact, he sort of honed in on what was enough to focus on: love God, love people, including ourselves. honestly, for now, that is plenty to play with. Kathy, I love it: Jenga faith! It really does explain it so well. The thing that I’m realizing is that I’ve been giving up so many “truths” that I used to cling to in exchange for the Person of Truth (Jesus)…so that I can BE True. I know that to people who just want to be “grounded in the word” that my last sentence does not even make sense! But to me it is more and more becoming a living reality. I quoted on this topic just today on my blog, so these are not all my original thoughts, but they are the sum of what I’m finding my life is right now. The best part is: Even if the Jenga puzzle comes tumbling down around my head, Jesus will still be there in the midst. He really will never leave us or forsake us, not even if Jenga pieces crash down on us. Thanks for sharing. Every time I read your writings I am more strengthened deep in my heart. Thank you for the encouragement, Kathy. It’s easy to feel somedays that since a few pieces have fallen out that I’m on a slippery slope to watching the whole thing come crashing down. It’s good to be reminded that Jesus is not the tower. Maybe the tower is only my feeble understanding of Him. Amen. Way to encourage me. I’m always afraid I’ve lost too many pieces, and am about to topple…then God takes more pieces out. But I’m still standing! I am going to be thinking about this for days. I like Hanan’s comment about the jenga tower being my own understanding- which I have oft mistaken for my faith. Since I came back to the faith after abandoning it for a long time, I find myself crunching thru piles of blocks at my feet- I like to pick them up off of the floor to look at them sometimes. I don’t try to build a new tower. My understanding will always come up short. I have come to learn that Jesus holds me in the bosom of his love, and I am delighted (and challenged) to walk with him, follow him, and be in relation with him as I am in relation with everyone and everything I touch. It is within the relationship that faith resides- and his grace pours toward us at every moment. His grace touches our jenga blocks too- whether they are seemingly solid, full of holes, or completely undone. It is not by the impermeability of our idea of faith that we are saved, but by his grace which we only have to look toward God, and open up to receive. It is the turning and receiving which is the faith of salvation. Wow…guess the journey I’m on is not so unique. Guess I’m playing spiritual Jenga, also. Since I’m sick in bed (seems fitting on Good Friday which always whacks me out a bit) my entry will be short but I just want to give two snapshots: 1) packed church service, pastor speaking about the love of God with loads of wisdom on “living right” and “shining your light for Christ.” I look around and see (assume) everyone is trying to make “right” choices and live righteously, while doing whatever it takes to get others to “see the light” and join the mass live right-be-a-light christian party. As I look around, people look pretty polished, well-groomed, almost shiny. 2) packed church service, pastor is asking us to consider who Jesus was/is and how he would be doing life here in the suburbs. Pastor doesn’t dish out 10 rules to live right but reminds us who Jesus hung out with and reminds us that the disciples, who lived with Jesus, still were astonished and couldn’t get a handle on who he was. I look around and see diversity: a gay couple, different colored skin, elderly and young. Suddenly I thought, this is where I belong. This is where Jesus would be. We’re all different but thirsty for the love and acceptance and dignity only he can offer. Thank you your words. I LOVE your jenga metaphor! I think it’s the way we need to look at faith for sure. Here’s where I get stuck though- what’s the bottom piece? Does it have to be the same for all Christians? I know some Christians who have like 90 pieces down there at the bottom and they get really nervous if you try to mess with any of them. I think something beautiful thing about what’s going on in the Church right now is a thorough questioning of the entire game, not just specific pieces. To take the metaphor another step, it seems to me like emerging christians tend to say “ok we can play jenga, but lets do it in outer space so there’s no gravity” …that makes it safe for us to move things all around without worrying about the slippery slope of moving certain pieces. thanks again for that great idea! what a great description of where I am right now. Thanks for sharing. hey all thanks for commenting…honestly, the comments are what make this whole blogging thing worth it, i think. otherwise, we put these things out in blogland and they just sit out there and i wonder “does anyone even connect with this thought or am i the only one?” so thanks so much for taking the time to comment. What a poignant post. 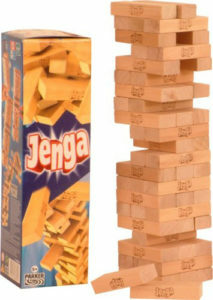 I’ve played Jenga a few times, but have never considered it as a metaphor for a changing faith. Thanks for the image. I’m still walking the faith journey and enjoying the view, even if it is foggy more than clear and smooth. I’ll be coming back for more and will comment more adequately in the future. Peace, and Happy Easter! I don’t know you, but got here thru a friend who had read this post. I love it! You write with such clarity, and bring such an accurate picture of the journey that many of us are on. Having just come from a holiday weekend of rubbing up against a bunch of relatives entrenched in churchianity/religion, I needed to be reminded that there are many others, like myself, sincere in their love for Jesus, but equally as sincere in their departure from the game of religion and right answers. Thanks again for the great visual! free spirit – welcome, and yes, you are not alone! I’ve been playing “Jenga Faith” for about three years now, and coming from a small and VERY conservative town in East Tennessee (ever heard of the Scopes Monkey Trial? ), I’ve had a hard time connecting with other people experiencing the same doubts and fears and faith discoveries. Most folks just think I’m going crazy! Thank you for your post. It’s always good to have a reminder (albeit online) that one is sane. rachel, oh boy, east TN and thinking these thoughts, that is hard! just remember you’re not crazy! stacy – thanks for stopping by! glad it was encouraging to you. metaphors help me, too!